Claviers was our home base for the month of March as we traveled throughout the region, visiting many of the plus belles villages and villages perchés of Provence. We rented a 700-year-old house that is typical of many in the area, four floors consisting of one large room each, stacked one above the other, and connected by a spiral staircase. In addition, there was a cave below and a rooftop deck with a magnificent view across the Riou River valley. The owners, an American professor and his French wife, have improved the interior with many modern conveniences while retaining the charm of an old home. We had a spacious, modern kitchen in which we cooked many meals, and a large dining area. There were three bedrooms, each with its own bath; and a combination office and TV room, with comfy furniture for reading, lounging or conversation. Topping it all is a tiled rooftop terrace. 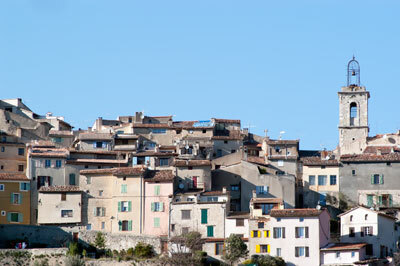 Claviers is surrounded by olive groves and remains mostly unspoiled by tourism. The town has an épicerie, wine store, boulangerie, tapisierie, bar/tabak, and a restaurant (closed during the winter months). The beautiful Saint Sylvestre church is opened only occasionally by an itinerant priest who travels from town to town for weekly mass. The bells, however, continue to chime every half hour, 24/7. Local vendors set up a small open-air market in the square every Saturday morning. During our visit, the town celebrated its first annual Clavolive, a festival of olives. It seemed a great success.